Freshwater planarians are widely used as models for investigation of pattern formation and studies on genetic variation in populations. Despite extensive information on the biology and genetics of planaria, the occurrence and distribution of viruses in these animals remains an unexplored area of research. Using a combination of Suppression Subtractive Hybridization (SSH) and Mirror Orientation Selection (MOS), we compared the genomes of two strains of freshwater planarian, Girardia tigrina. 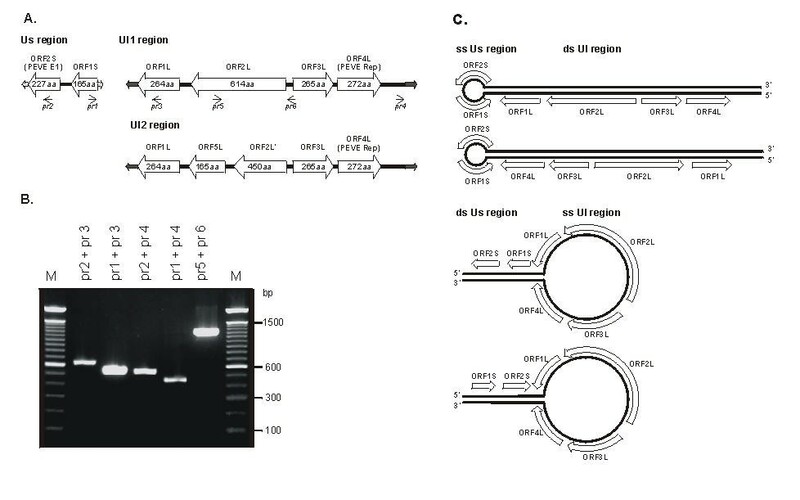 The novel extrachromosomal DNA-containing virus-like element denoted PEVE (Planarian Extrachromosomal Virus-like Element) was identified in one planarian strain. The PEVE genome (about 7.5 kb) consists of two unique regions (Ul and Us) flanked by inverted repeats. Sequence analyses reveal that PEVE comprises two helicase-like sequences in the genome, of which the first is a homolog of a circoviral replication initiator protein (Rep), and the second is similar to the papillomavirus E1 helicase domain. PEVE genome exists in at least two variant forms with different arrangements of single-stranded and double-stranded DNA stretches that correspond to the Us and Ul regions. Using PCR analysis and whole-mount in situ hybridization, we characterized PEVE distribution and expression in the planarian body. PEVE is the first viral element identified in free-living flatworms. This element differs from all known viruses and viral elements, and comprises two potential helicases that are homologous to proteins from distant viral phyla. PEVE is unevenly distributed in the worm body, and is detected in specific parenchyma cells. Freshwater planarians (Platyhelminthes, Turbellaria, Tricladida) are widely employed for pattern formation investigations. planaria differ from other models used to study morphogenesis (insects, nematodes, fish, amphibians and mammals) by their phenomenal ability to regenerate . Moreover, planaria are used for in vivo tumorogenicity studies of pure compounds and complex environmental mixtures, and for mechanistic studies of tumorogenesis . Planaria are prospective models for genetic variation studies in populations. The planarian species (Planariidae family) are represented by different strains employing various modes of reproduction, including exclusively sexual, exclusively asexual, or both sexual and asexual [3–6]. Strains that reproduce exclusively asexually are genetically different to strains of the same species able to reproduce both sexually and asexually. For instance, an asexual strain of Dugesia (S) mediterranea exhibits morphological heteromorphosis in the third pair of chromosomes . Worms belonging to different asexual strains of Dugesia japonica and Girardia (formerly Dugesia) tigrina are triploid or mixoploid, while sexual strains are diploid [5, 6]. Asexual strains are represented by independent populations that propagate only by fission. Recently, we supplemented the well-known SSH# (suppression subtractive hybridization) technology [7, 8] with the Mirror Orientation Selection method (MOS) for eliminating background clones from SSH-generated libraries . This innovative procedure allowed the application of these techniques in the subtraction of large eukaryotic genomes, including those of freshwater planarian (haploid genome size of G. tigrina is 1.4 × 109 bp ). Using the SSH-MOS combination, genomes of two different strains of G. tigrina were compared. Novel virus-like element with unusual features was identified in one planarian strain. We characterized the genome structure of the novel element and analyzed its distribution in the planarian body. Two planarian strains were used for comparison. One was an asexual strain maintained as laboratory culture in Moscow (Russia) for over 20 years. Worms belonging to this strain have been successfully used for various experiments, including gene discovery [11–13]. The second strain, collected in Russia near Moscow, represented sexual planaria capable of both sexual and asexual reproduction. The specimens were assigned to G. tigrina on the basis of their external appearance [5, 14, 15]. This strain is morphologically similar to the sexual strain collected previously in Spain  and like the Spanish animals, differs from asexual planaria in their size and details of coloration. Unlike asexual animals, mature planaria of the sexual strain possess well-distinguished reproductive organs and lay fertile cocoons. To verify the genetic propinquity of the sexual and asexual planarian strains, we analyzed mariner element sequences from the asexual and the sexual specimens. Several DNA sequences similar to the mariner element have been reported in G. tigrina [10, 16]. There are about 7000 copies of this element in the genome, which appear to code for an active transposase . None of these mariner elements are present in the genomes of other turbellarians, including the species closest to G. tigrina . With the aid of PCR using specific primers for the planarian mariner element, we isolated and sequenced several clones from sexual and asexual planaria. All clones displayed 98–99% identity at the nucleotide level, and the differences between sequences of various strains did not exceed the diversity within one strain. Based on these data, we conclude that the two planarian strains represent a valid model system for studying genetic differences between planarian populations, and can be used for the subtractive hybridization of genomes. Two subtracted libraries were generated: the first enriched with asexual strain-specific DNA fragments (AS library), and the second with sexual strain-specific DNA (SS library). Differential screening revealed 30% and 60% strain-specific clones in SS and AS libraries, respectively. Sequence analyses of selected AS-specific clones demonstrated that about 50% contained open reading frames (ORFs) with codon usage unusual for G. tigrina . Some of these AS-specific ORFs encode polypeptides similar to viral proteins. When used as probes in Southern blot hybridization with undigested sexual and asexual planarian DNA, these clones stained two relatively low molecular weight DNA bands in asexual specimens only (Figure 1). The intensity of hybridization signals was significantly higher (more then 100-fold) than that for the unique genomic sequence (data not shown). Electrophoresis and Southern blot analysis of PEVE Line M – marker, 1 kb ladder (Gibco BRL); Line 1 – denaturing Southern blot hybridization of asexual planarian DNA with ORF2S as a probe. Equivalent data were obtained for all other PEVE clones; Line 2 – denaturing Southern blot hybridization of sexual planarian DNA with ORF2S as a probe. Equivalent data were obtained for all other PEVE clones; Line 3 – non-denaturing Southern blot hybridization of asexual planarian DNA, using the ORF1L fragment as a probe. 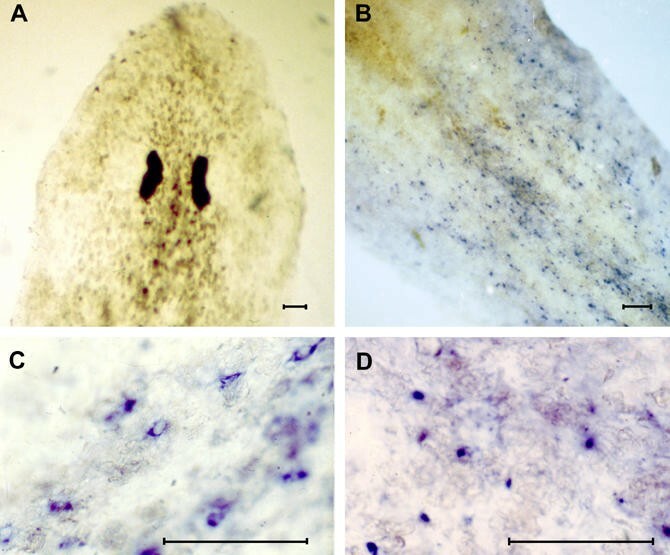 Similar results were observed with all probes from the Ul PEVE region; Line 4 – non-denaturing Southern blot hybridization of asexual planarian DNA with ORF2S as a probe. 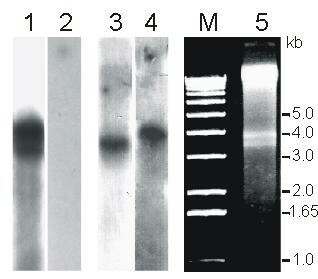 Comparable results were obtained with the ORF1S probe; Line 5 – partially purified PEVE DNA on an agarose gel stained with ethidium bromide. Our results imply that most AS-specific clones are linked to an amplified extrachromosomal virus-like element designated PEVE (Planarian Extrachromosomal Virus-like Element). Using PCR with combinations of primers designed from these PEVE sequences and the genome-walking approach, several overlapping fragments constituting the 7.6 kb contig were isolated. PCR analyses with PEVE-specific primers showed that the putative viral genome comprises two unique regions flanked by inverted repeats, specifically, Us (1911 bp, GenBank Accession No: AF364089) and Ul regions. Two types of Ul region were identified that displayed some sequence difference: Ul1 (5699 bp, GenBank Accession No: AF364090) and Ul2 (5695 bp, GenBank Accession No: AF364091). A schematic diagram of the regions with predicted ORFs is presented in Figure 2A. PCR analyses with different combinations of primers specific for PEVE revealed four variants of orientation of Ul and Us, relative to one another (Figure 2B). PEVE genome organization (A) The structure of Ul and Us regions that constitute the PEVE genome. ORFs are specified by open arrows, and their orientations by the direction of the arrows. Arrow numbers signify the length of the putative proteins encoded by ORFs. Small dark arrows indicate flanking inverted repeats. Simple arrows specify the primers used for PCR analysis shown in (B). M – marker, 100 bp ladder (Gibco BRL). positions of primer used for PCR were as follow: pr1 (Us region) 286–305; pr2 (Us region) 1518–1541; pr3 (Ul1 region) 461–482; pr4 (Ul1 region) 5430–5452; pr5 (Ul1 region) 1765–1786; pr6 (Ul1 region) 2985–3005. (C) Putative PEVE genome variants. To purify PEVE DNA, the plasmid DNA alkaline lysis method was used. Partially purified PEVE DNA was visualized on an agarose gel, following ethidium bromide staining (Figure 1). Two bands corresponding to two extrachromosomal DNA fragments were detected. Southern blot hybridization with different PEVE-specific probes revealed that each fragment contained the entire PEVE sequence (Figure 1). Using non-denaturing Southern blot hybridization on planarian genomic DNA, we established that the PEVE Ul sequences hybridized to the lighter fragment, whereas Us probes stained the less mobile fragment (Figure 1). These results imply that the lighter fragment contains a single-stranded (ss) Ul region and double-stranded (ds) Us region, while the less mobile fragment is composed of ss Us and ds Ul sequences (Figure 2C). BLAST analyses of identified ORFs showed that two were significantly similar to known viral proteins characteristic of distant viral phyla. Other ORFs displayed no significant homology to known proteins. The protein encoded by ORF2S (designated PEVE E1) is homologous to the helicase domain of superfamily 3 (SF3) viral helicases, such as E1 proteins of papillomaviruses (Figure 3) [18–20]. Similar to SF3 helicases, the PEVE E1 domain contains a P-loop (motif A) and two conserved motifs (B and C) that determine helicase function [18, 19]. However, unlike SF3 helicases, PEVE E1 contains only the helicase domain with no additional protein domains. 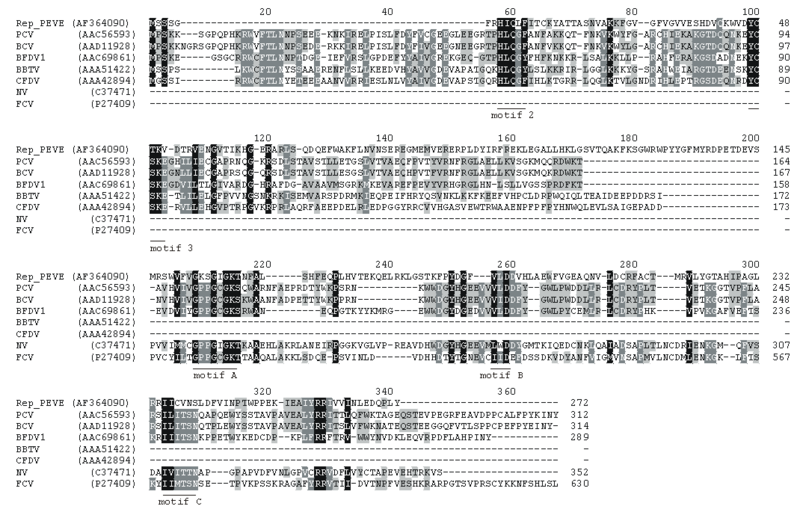 Multiple sequence alignment of the C-terminal regions (for HPV-16, from aa 378 to 600) of several SF3 helicases and full-length PEVE E1 protein Strictly conserved residues are displayed as white letters on a black background. E1 – E1 protein; NS1-NS1 protein; HPV16-human papillomavirus type 16; BPV1 – bovine papillomavirus type 1; Tag_SV40 – UL T antigen of SV40 virus; AAV2 – adeno-associated virus type 2; BPAV – bovine parvovirus. The sequence of the ORF4L product (denoted PEVE Rep) is homologous to circoviral replication initiator (Rep) proteins (Figure 4). Rep proteins of circoviruses, nanoviruses and geminiviruses consist of two domains, specifically, a N-terminal nicking domain (with conserved motifs 1, 2 and 3) and a C-terminal SF3 helicase domain (conserved motifs A, B and C) [21, 22]. Conserved sequence motifs 1–3 are characteristic of Rep proteins that utilize the rolling circle mechanism of replication employed by different groups of viruses (circoviruses, nanoviruses, geminiviruses, bacteriophage φ ×-174) [21, 23–25]. However, replication-associated proteins of animal parvoviruses, which utilize the rolling hairpin mechanism of replication, only contain motifs 2 and 3 . Multiple sequence alignment of the complete sequences of PEVE and circovirus Rep proteins supplemented with the N-terminal region of nanoviral Rep and the C-terminal region of caliciviral 2C-proteins Strictly conserved residues are displayed as white letters on a black background. BCV – Bovine circovirus; PCV – Porcine circovirus; BFDV1 – Beak and feather disease virus; BBTV – Banana bunchy top virus; CFDV – Coconut foliar decay virus; NV – Norwalk virus; FCV – Feline calicivirus. The PEVE Rep protein is considerably similar to circoviral Rep proteins and comprises two domains. The C-terminus of PEVE Rep contains all three conserved motifs (A, B and C), signifying helicase activity. However, like animal parvovirus Rep proteins, the N-terminal part of PEVE Rep contains only conserved motifs 2 and 3, suggesting replication by the rolling hairpin mechanism. For analysis of PEVE distribution in planarian body, a single planarian was cut transversely into six zones as depicted in Figure 5A, and six corresponding DNA samples were prepared. PCR data from these samples showed that PEVE is distributed unevenly along the worm's body (Figure 5). The anterior zones (zones 1 and 2) contain lower concentrations of the element than the posterior part of the worm. Analysis of PEVE distribution and expression in planarian body (A) Six fragments of the planarian body presented in the scheme were used to prepare first-strand cDNA and genomic DNA samples, which were subsequently employed for PCR with oligonucleotide primers for PEVE ORFs. Lines 1–6 correspond to the tissue samples taken as shown at scheme. PCR was performed with oligonucleotide primers for ORF2S (5'-caacgatagtcaccggaatgtca-3' and 5'-gcggctcctgtcttgagtcc-3') and ORF4L: (5'-ttttcatcagcatgtccgttcg-3' and 5'-cctcggttcaggcatctgtttc-3') Each PCR cycle included 95°C for 10 s, 64°C for 15 s and 72°C for 40 s. twenty one cycles were performed in the case of genomic DNA samples and twenty four cycles in the case of cDNA samples. Line 7 – negative control. RNA sample from zone 4 was used for RT-PCR without prior first-strand cDNA synthesis. (B) Northern blot analysis of the ORF2S (line 2) and ORF1L (line 3) transcripts. Line 1 – negative control. Hybridization with ORF2S probe was performed on RNA sample pre-treated with RNase A. M – marker, 0,16–1.77 kb RNA ladder (Gibco BRL). We analyzed the PEVE expression using Northern blot analysis and RT-PCR (Figure 5). ORF2S and ORF1L probes were used for Northern blot. The ORF1L probe hybridized to an about 1000 base poly(A)+ message. The major transcript revealed by ORF2S probe hybridization was about 850 base. For each gene, transcript length obtained using Northern blot is consistent with the cDNA length plus a poly(A) tail, assuming the putative promoter (positions 1133–1094 for ORF1L and 944–983 for ORF2S) and potential polyadenylation signal sequence are utilized. RT-PCR studies showed that all PEVE ORFs are expressed in planarian body with the same pattern. PEVE expression was not detected in the head region, and increased from zone 2 to the tail. Whole-mount in situ hybridization with PEVE RNA probes confirmed the above data. PEVE-containing cells were not detected in the head region, and increased in number from zone 2 to the tail. Cells containing PEVE were sparse in unstained parenchyma (Figure 6A,6B). Whole-mount in situ hybridization with ORF1L riboprobes performed on intact planaria (A) Whole-mount in situ hybridization with antisense ORF1L riboprobe of planarian head. (B) Whole-mount in situ hybridization with antisense ORF1L riboprobe of planarian central body region. Bar, 20 μm (C) A larger magnification of the results of whole-mount in situ hybridization with the antisense ORF1L riboprobe. (D) Whole-mount in situ hybridization with the sense ORF1L riboprobe. For ORF1L and ORF2S, both sense and antisense riboprobes displayed visible staining (figure 6C,6D), while in situ hybridization with sense ORF4L probe yielded no signal (data not shown). We proposed that sense probes can hybridize with PEVE ss-DNA, while antisense probes can hybridize with both RNA and ss-DNA. If so, there is one polarity of the ss DNA regions within PEVE. ORF1L and ORF2S are present in the antisense orientation and their sense probes hybridize with PEVE ss-DNA stretches. 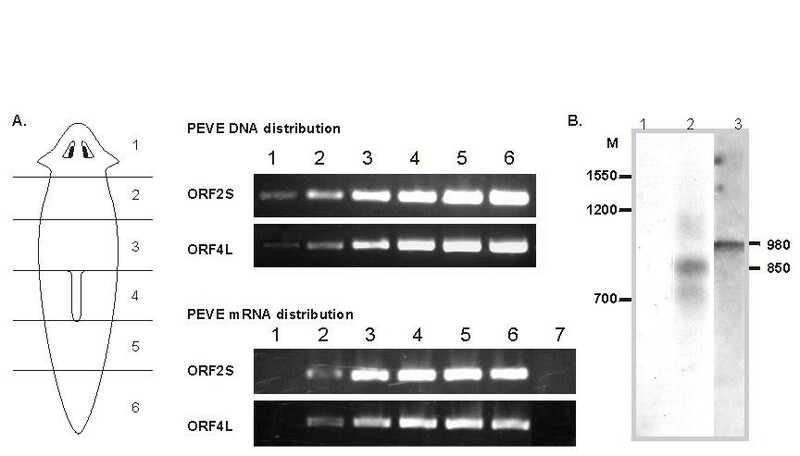 ORF4L exists in the opposite (sense) orientation within the ssDNA region of PEVE and ORF4L antisense probe hybridizes with both PEVE RNA and ss-DNA. We performed PEVE analyses in asexual planaria from an independent Spanish population. PCR with PEVE-specific primers of genomic DNA and cDNA, and Southern blot hybridization on genomic DNA did not reveal PEVE in planaria nucleic acid samples (data not shown). This indicates that only our asexual planarian population is infected by PEVE. Using the subtractive hybridization technique, we identified a novel planarian virus-like element, PEVE. Examination of PEVE genome organization and structure reveals that this virus-like element cannot be assigned to any known group of viruses or plasmids, and thus represents a novel type of viral element that encodes two helicases in one genome. Both putative helicases may be involved in the initiation of DNA replication. The proposed scheme of PEVE genomic organization is presented in Figure 2C. Based on Southern blot and in situ hybridization data, we hypothesize that PEVE exists as two variant forms with different compositions of ss and ds DNA stretches, corresponding to the Ul and Us regions. The ss stretches are present in a unique orientation and therefore have only one type of polarity. The ss Ul region displays sense orientation for ORF4L and antisense for ORF1L, while the Us region comprises a strand with all encoded ORFs in an antisense orientation. These ss regions are flanked by ds sequences in both orientations. PEVE is distributed unevenly along the worm's body. Our PCR data reveal very low amounts of the viral-like element in the head region. The PEVE expression was also detected in central and tail regions and was not found in head region. In accordance with in situ hybridization data, PEVE is detected in certain differentiated parenchyma cells. PEVE is the first viral element identified in free-living flatworms. This novel element is not widespread in planarian populations, and has been detected in only one planarian asexual strain to date. However, it is possible that similar virus-like elements and viruses are present in other planarian strains. Although asexual strains of planaria exist independently for a long time, they display substantial genetic resemblance. In particular, the identities of five Antennapedia-like homeobox genes have been disclosed from both our and the Spanish asexual strains [11, 26]. These findings imply that PEVE may affect other asexual strains of planaria, thus paving the way for the development of transgenic planaria using the planarian viral sequences as vectors for introduction of exogenous DNA into planarian cells. We have identified a novel extrachromosomal viral-element (PEVE) in the asexual strain of planarian G. tigrina. PEVE is the first viral element identified in planaria, and comprises two potential helicases that are homologous to proteins from distant viral phyla. This element cannot be assigned to any known group of viruses or plasmids. PEVE is unevenly distributed in the worm body, and is detected in differentiated parenchyma cells. Experiments were conducted on both sexual and asexual strains of the planarian Girardia (formerly Dugesia) tigrina (Platyhelminthes, Turbellaria, Tricladida). Animals used in subtractive hybridization (from both sexual and asexual strains) were generously provided by Dr. Sheiman I.M. (Institute of Biophysics, Pushino). Genomic DNA and total RNA from asexual planaria of the Spanish population were supplied by Dr. Salo E. (University of Barcelona). Genomic DNA was isolated from planaria using a rapid extraction method . DNA was further treated with RNase A for RNA degradation. Total RNA was purified by homogenization with guanidine isothiocyanate and phenol/chloroform extraction . All procedures was performed at neutral pH. RNA was precipitated with 96% ethanol, dissolved and then re-precipitated with 12M lithium chloride. RNA was further treated with bovine DNAse I (Sigma) to degrade impurity DNA. The Advantage RT-for-PCR Kit (CLONTECH) was used for cDNA synthesis. Planarian genomic DNA of 10 animals from each strain was used for subtractive hybridization. SSH was performed as described in the CLONTECH PCR-Select™ Bacterial Genome Subtraction protocol. MOS and differential screening were performed, as described earlier . Total genomic DNA (100 mg) from planaria was dissolved in 100 μl TN buffer (10 mM Tris-HCl, pH 8.0; 5 mM NaCl), and mixed with two volumes of 0.2 M NaOH with 1% SDS, followed by 1.5 volumes of 5 M potassium acetate (pH 4.8). The mixture was incubated for 10 min at 4°C, and centrifuged at 14000 × g for 10 min. Following transfer of the supernatant into another tube, PEVE DNA was precipitated with isopropanol. Purified PEVE DNA was dissolved in TN buffer and detected on an agarose gel, following ethidium bromide staining. Approximately 300 ng undigested planarian genomic DNA from each strain was resolved on agarose gels and transferred to Hybond-N membranes (Amersham). A standard protocol was used for denaturing Southern blot hybridization , while for non-denaturing hybridization, DNA was transferred to membranes under non-denaturing conditions. Hybridization was performed using an optimized low-background protocol . Total RNA from planarian (10 μg per line) were fractionated by 1,1% formaldehyde-agarose denaturing gel electrophoresis and transferred to the Hybond-N membrane that was used for hybridization with [α-32P]-labeled probes. Gel-electrophoresis and transfer of RNA to the membrane were carried out in accordance with the standard protocol . The hybridization was carried out according to the optimized low-background protocol . PCR amplified DNA fragment for probe preparation was purified using Wizard PCR Preps Columns (Promega) and labeled using Prime-a-Gene Labeling System (Promega). For negative control, the RNA sample was treated with RNase A before fractionation. Genomic DNA and first-strand cDNA prepared from different planarian body regions were used in PCR analyses to detect PEVE distribution and expression. PCR was performed with the Advantage 2 PCR Kit (CLONTECH). PCR with oligonucleotide primers for Dth-2  was used to confirm the uniformity of the samples. The cDNA clones of ORF1L, ORF4L and ORF2S were used as templates to produce DIG-labeled RNA probes for in situ hybridization. Whole-mount in situ hybridization was performed, as described previously . We thank Prof. V.I. Agol and Prof. A.E. Gorbalenya for helpful discussions. We are additionally grateful to Dr. M.V. Matz for advice, and Dr. I.M Sheiman for providing the animals used in this study. Dr. E. Salo is acknowledged for supplying nucleic acid samples from asexual Spanish planaria. This work was supported by the Russian Foundation for Young Scientists RAS, and Russian Foundation for Support Domestic Science (grant to S.L.). DR carried out the subtractive hybridization of planarian genomes and PEVE cloning. MB carried out whole mount in situ hybridization and PCR and RT-PCR analysis. EB carried out Southern blot analysis, participated in the sequence alignment and analysis, and drafted the manuscript. LV carried out Northern blot analysis. SL conceived of the study, and participated in its design and coordination.